Need Centralized Settings in QC-CALC/GageStation for your plant? Learn more about the Administrative Tools in QC-CALC and QC-Gage and start managing your settings and privileges centrally. Prolink is excited to introduce a new product called QC-Mobile. QC-Mobile is Prolink's first fully browser based web application. Designed as a companion application to the Enterprise Report Scheduler (ERS), it brings your reports, dashboards, full views, real-time plots, and statistics to any device on the floor without the need to install software. Plus, it features an industry first QR code linking functionality making it possible for management to access relevant data about a process without prior knowledge of the software. Imagine posting printed QR codes in each cell throughout your plant that link directly to the current quality results of that cell. Management can then check the current status of the cell with his/her mobile device by simply scanning the QR code. Welcome to the future of SPC! Would you like to try it out now? The QR code at right was generated by ERS 3.4 and links directly to simulated data on our website. Either scan the QR Code off your screen using your mobile device or click it with your mouse (it is a hyperlink). 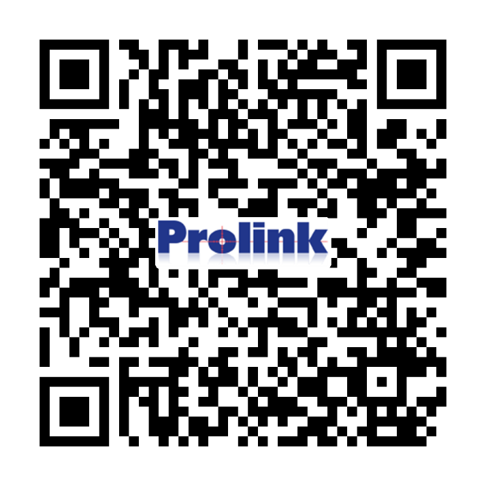 Prolink will be hosting our second user conference this fall during the Quality Show in Rosemont, IL. Details and invitations will be sent during the early summer. In todayâ€™s fast paced manufacturing environment operators can struggle to make process adjustments because they donâ€™t have the time or ability to interpret the part measurement results. The Reaction Plan Manager++ software solution takes data collected from QC-CALC Real-Time, analyzes it and automatically displays specific adjustment instructions for the operator in real time. Itâ€™s like having an engineer on the floor 24 hours a day 7 days a week. Use the link below to learn how Kemlab Production Components, a division of Kemco Aerospace Manufacturing is using Reaction Plan Manager++. When QC-Gage 3.2 was released several years ago, it included a convenient feature called Spec Plan Defaults. This feature allows you to set default values that you want to be included in every new spec plan you create going forward. While this continues to be a useful feature, what happens when you already have 500 spec plans and need to change a setting in each of them? Nobody wants the tedious task of updating each plan manually. The answer is the The answer is the Bulk Spec Plan Editor. It is a separate application (included with QC-Gage 3.4) that allows you to make changes to groups of existing spec plans. While the application has been present for a while, we added a menu to QC-Gage in 2016 for convenience (Tools > Launch Spec Plan Bulk Edit Tool). 1. Start by choosing a folder path to the spec plans that will be updated. 2. Move the desired spec plans from the Available list to the Selected list. 3. Add any number of changes that you will want to execute on each spec plan in the list below using the green plus icon. 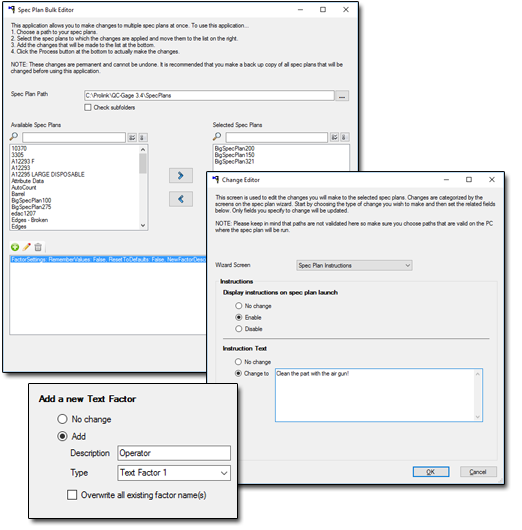 In my example below, I added a text factor called Operator to each spec plan (it will automatically find the next available factor for each plan) and also added a message box that will popup on launch telling the user to clean the parts before measurement. 4. Click the Process button to apply the changes to the selected list of plans.